In 2008, Omaha hosted NCAA Men’s Basketball Tournament games. To be honest, none of those games that year were very significant. All the teams that were supposed to win did, and they did so in large margins. The great thing about the games this week four years later, it was the total opposite. Each game played a significant part of the day — although some more than others. Here are some thoughts from all four of Friday’s’ games. Norfolk State wins the folks of Omaha. 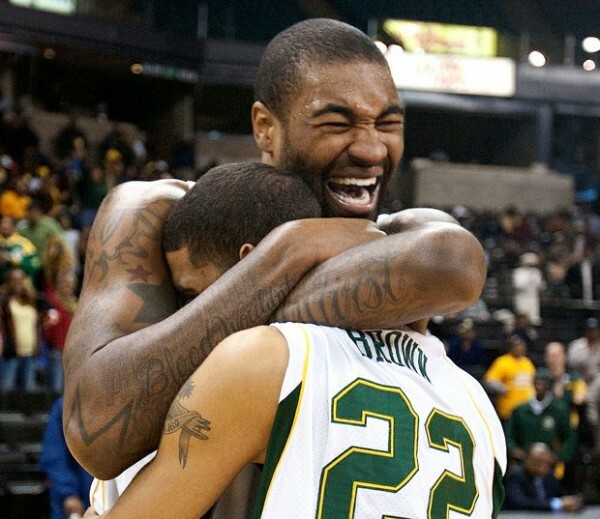 Norfolk State got its first taste of the NCAA Tournament on Friday against Missouri. What they didn’t know was that they were supposed to lay down for the Tigers to let Missouri get to the next round. You could tell right away just by the spirit squad and pep band came into the arena. One thing about schools from the MEAC and the SWAC is that they have awesome bands. The advantage I had was that I was pretty much right next to them the whole game. They were a vocal bunch as well. That energy was also seen then from the players on the court. Kyle O’Quinn nailed a three-pointer midway through the first half from the top of the key. On his way back on defense he had this huge smile on his face. He knew that there was something special happening. The thing about Omaha is that the people there love big events. The College World Series in baseball has been a mainstay for over 50 years and will be here for at least another 20. Big name concerts come to town and they fill the CenturyLink. The United States Swimming trials four years ago made such an impression that they will be back in Omaha again this summer, which is unprecedented. The Omaha community has also embraced the NCAA Tournament by selling out all sessions in the two most recent years it has come to town. Omaha fans took Norfolk State under their wing and helped create some history by facilitating something that had happened only four times in 109 tries before heading into the day. After Friday that win number went to six. Norfolk State had to wonder where they would stay since their hotel was booked for the rest of the weekend, but I guess that was a good problem to have. What I am interested to see on Sunday is whether the Omaha crowd again embraces the Spartans in their game against Florida. If they do, it could be a very interesting environment. Kansas stomps its foe. After seeing Missouri lose earlier in the day and Duke losing to Lehigh soon after that, there was a buzz in the arena on whether the #2 seeds in the tournament were jinxed on Friday. In the first 10 minutes of the Jayhawks’ game against Detroit, it looked like it could be another upset brewing. But then after a timeout by head coach Bill Self with just under nine minutes left, Kansas got things going and went on a 34-7 scoring run over the next 16 minutes. After that it was game over for the Titans, who really struggled to make any baskets much less getting any good looks in that stretch. While Duke and North Carolina get to play in their back yard most years, Kansas is beginning to like Omaha with its two trips here over the past four years. Other than Kansas City, Omaha is pretty close to being in their own backyard. Virginia & Florida overshadowed. The Cavaliers and Gators opened up play at the CenturyLink Center on Friday. Once the game was over, it looked a lot like one of the games back in 2008 when the Tournament was in Omaha, with teams pulling away as the game went on. It was ugly basketball in the first half. Both teams couldn’t hit a three-pointer at all. They finished a combined 1-of-22 for the half. While Florida relied on its outside shot, Virginia was having some success from the inside. The second half was completely the opposite — Florida kept driving to the basket while Virginia relied on jump shots. Florida, which set a school record for three-pointers this season, was actually able to pull away by getting inside. Will they do the same on Sunday against Norfolk State, or will they not need it if their outside shots start falling? Unfortunately this game was somewhat overshadowed by other circumstances not directly related to the game on the court. While Omaha is hosting this pod, the permanent tenant in that building, Creighton, was playing its own NCAA Tournament game in Greensboro at the same time. With a lot of Omaha residents having tickets to this local event, they were very interested in the Bluejay game. Out of nowhere during quiet parts of Florida/Virginia, you could distinctly hear random cheers in the arena. Many were in the concourses watching the Creighton/Alabama game. The kicker is that this may happen again on Sunday as Creighton will be in the second half of its game against North Carolina when Florida and Norfolk State tip off here. Additionally, the Creighton women’s basketball team will be opening NCAA Tournament play as well at the same time as the men. Definitely a lot of split allegiances this weekend. St. Mary’s made it interesting–The Purdue/St. Mary’s game had a distraction of its own on Friday as the environment was still buzzing over the Norfolk State win. A large contingent of media row was empty during most of the first half of this game with their own enthralled excitement over the big upset. Also, since this was the beginning of the evening session, the arena was in the process of filling again with fans coming back in or arriving for the first time. But the Boilermakers and the Gaels were still playing their game. Before you knew it, Purdue looked like they were going to run away with this one, getting ahead into the double-digits. That’s when St. Mary’s came to life in the latter stages of the game, gradually cutting into the Purdue lead. As the crowd was getting prepared for Kansas/Detroit, due to a large contingent of Kansas fans, the Gaels went on a huge run and eventually took the lead with under a minute to go. By then the crowd was just as enthused as they were earlier in the day and you could again feel a surge of excitement of the game that came down to the wire. As time expired and the Gaels were down by three, the ball was in the hands of Rob Jones, who had a monster second half for St. Mary’s. He sent the shot from behind the arc. With the day that was happening, you sort of felt the game would head to overtime. But then the ball caromed off the side of the rim and the buzzer sounded. Purdue escaped with the close victory. There was drama throughout Friday in Omaha. It will make for an interesting Sunday. There will be two compelling games and two teams that will eventually emerge as victors and headed to the Sweet Sixteen. This entry was posted on Sunday, March 18th, 2012 at 7:35 am by Patrick Marshall	and is filed under 2012 ncaa tournament. Tagged: detroit, florida, kansas, kyle o'quinn, missouri, norfolk state, omaha, purdue, st mary's, virginia. You can follow any responses to this entry through the RSS 2.0 feed. You can leave a response, or trackback from your own site.